Restaurant SEO: This is a dense topic for anyone who isn't 100% "tech-savvy," but it could have immense value for your restaurant's website and business in the future. 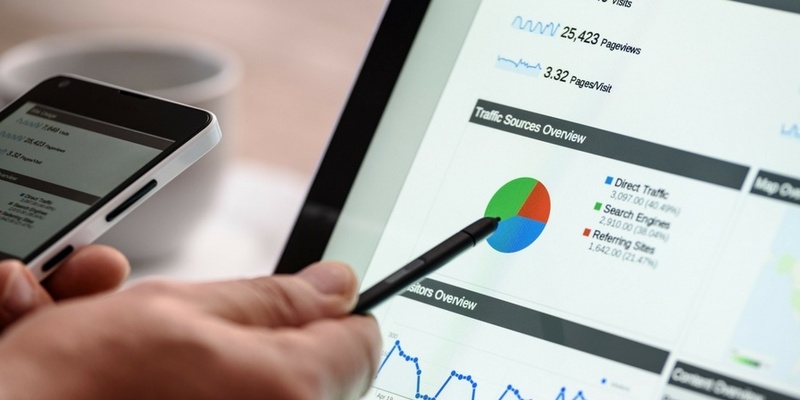 This article outlines the steps you can take to optimize your restaurant website for Google. Restaurant SEO, or search engine optimization, is the process of making sure that search engines (and other automated devices) are able to keep your most valuable information (phone number, hours of operation, location, menu, etc.) up to date, while presenting the best data to your potential guests and customers. One of the ways this is done is through a language called “schema,” and the benefits to understanding this language and incorporating it into your website continue to increase. We're about to get a little (OK, a lot) technical here, so if you're having trouble following along, forward this article to your webmaster, or leave a comment below! Let's start by getting the dry and dense out of the way as quickly as possible. Schema and microformatting are a way to make your websites' content more easily understood by Google and other search engines. Search engines are always trying to learn more about your business. Posting information such as the type of food you serve, your hours of operation, and your contact information is so important to help them do that. Search engines also want to be able to differentiate between a menu, a blog post, a review, etc. Your website can make search engines' jobs easier, and potentially get better results and higher rankings, simply by implementing a language designed specifcally for Google and other search engines. We do this through microformatting (HTML is a formatting language, microformatting defines within it), using a structure called schema. Back in September 2015, I wrote an epic article, The Huge Guide to Google My Business & Local Search for Restaurants. 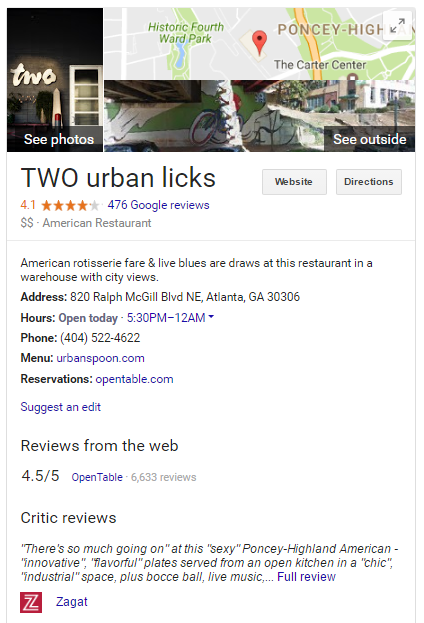 The focus in that article was in encouraging restaurants to claim their Google My Business page in the Google index, and to keep it up to date. While you might be aware of this, Google is actively pulling information from sources such as third-party directories and your own website in order to create what they call “Knowledge Panels" which show on the right-hand side of a search engine result page. It might find that your hours of operation say one thing in Open Table, but might say something else entirely on your own website. And sometimes it gets that information wrong based on how it interprets the data on your website. For many websites, schema isn’t on their radar, and instead, Google My Business is the best means for keeping that data correct. But remember, Google isn’t the only source actively seeking to keep the data up to date, so don’t stop at just Google My Business. Your website should offer the most valuable and up-to-date pieces of information about your restaurant. Keep in mind: in a large percentage of the queries where this data is shown, it's fulfilling the information needs of the visitor. That visitor might not need to go to your website in order to get the information they need to visit your restaurant, such as phone number, address, and hours. This might result in fewer visits to your website, but more customers walking through your doors. Google has told us that it uses schema in order to generate and update the Knowledge Panels. But we should also look at the other methods that Google uses to gather and verify information. Google makes extensive use of third party directories to validate data, or to create new records when a record is cross-referenced by multiple high-level directories. Tools such as Moz Local are a cost-effective means of keeping your top-level information accurate across a wide spectrum of directories. 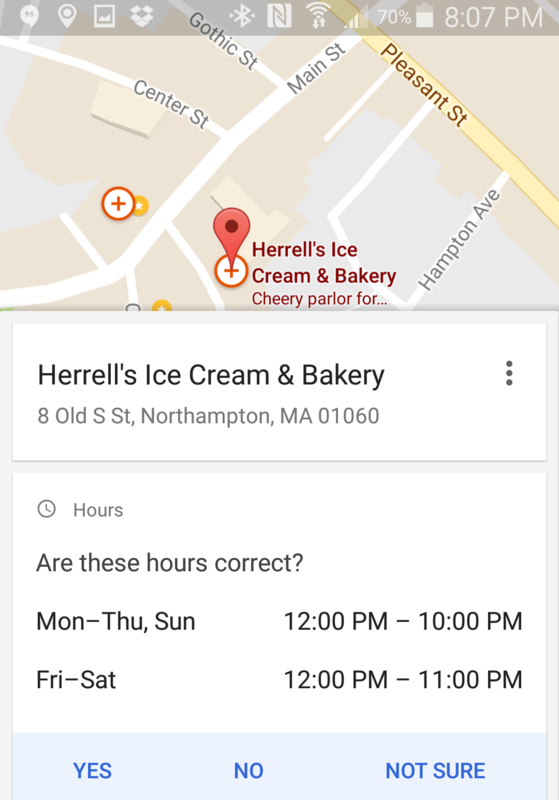 Over the last two years Google has created an expanded a program called Google Local Guides. 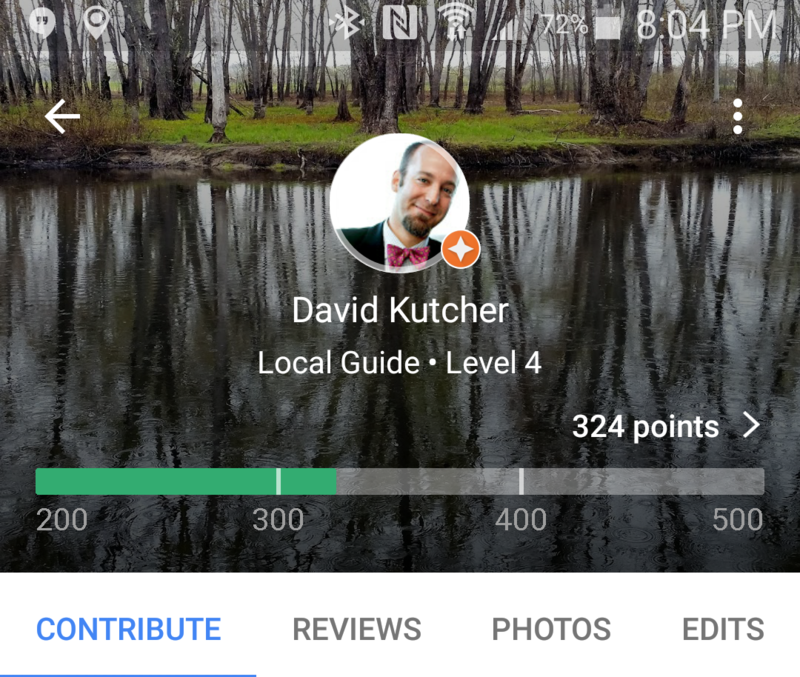 The Local Guides program is attached to a person’s Google account, Google Maps, and Google Local, and encourages people to contribute to local listings, leave reviews, upload and share pictures, and verify data. If a person is signed up as a Local Contributor, when they’re in proximity to a restaurant, they’ll get messaged that there is an opportunity for an update available. Crowdsourced data can be valuable… or it can be notoriously poor. A contributed review might have lots of semantic value, but how much do you trust someone to actually look up the hours of a business and correctly validate the information? While we can’t be certain how much credibility Google lends to the many ways that it is finding and validating information, we can only hope that it gives priority to structured data on your own website, as well as information supplied by the owner through Google My Business. Don’t leave your data up to chance and local contributors if you can help it: take advantage of schema and Google My Business. When it comes to managing your business information on Google, the best bet is to get set up in Google My Business and check back in on your listing periodically. When you first claim your listing, you’re likely spending a bit of time to get all of the details in and to make the listing as complete and accurate as possible. And that’s what you should be doing. But your listing information isn’t static. It’s being added to, suggested changes are being made, Google is cross-referencing that data against other directory data … and it’s imperative that you check your data periodically so that your business isn’t being misrepresented or showing incorrect data to potential customers. Imagine if your address was wrong! A restaurant’s menu is one of the most sought-after pieces of data that a restaurant can provide to potential customers. People want easy access to the website menu (not PDFs! ), especially on mobile so they can see what their options are before they choose to “buy” or reserve a table. 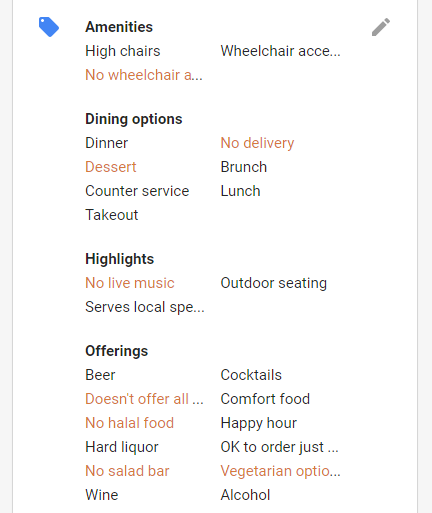 Google knows this and created a Knowledge Panel for the menu (see below), making the restaurant's menu interactive across a variety of devices. The only problem is that Google didn’t give restaurants a direct way of updating this data, instead relying on 3rd party providers. The restaurant could be updating their website’s menu daily to feature specials or changing seasonal menus, but their menu in Google Search might be showing dishes that were no longer on the menu from weeks or months ago, leading to irate patrons or missed opportunities. You could structure the data as clearly as you wanted on the website, but while Google would scrape other content from your site (contact info, hours, etc. ), it didn't pull menu data the same way. In August 2016 I joined the Schema working group’s repository to create a set of definitions to expand how restaurant menus are treated in schema data. A quick refresher: Microformatting, often using schema, is one way that you can provide greater structure and understanding to search engines about your content, and the more you can help them understand your content, the greater value they place on your website. I initiated a discussion by submitting an Issue/Request, discussing the current limitations in how menus were treated within Schema for restaurants, and identifying some of the problems that were occurring. (You can read the discussion here.) After lengthy discussion with some incredibly detail-oriented engineers and a long period of silence, we have learned that Menu, MenuSection and MenuItem have been added to the forthcoming release (3.2) of schema! We believe our clients, One Midtown Kitchen and TWO Urban Licks, were the first restaurants to take advantage of the new schema. This isn’t live yet, and it’s not yet being used by Google or other search engines, but it’s important for restaurants to be aware of this and to implement it once it is ready. The Menu schema hasn’t yet been upgraded, and details of it are still being hotly debated and defined, but we’ve taken a stab at how it could be implemented. A whole lot more detail and structure, but turning an unstructured block of text into a very structured detail of your menu could mean the difference between a customer eating at your restaurant or the restaurant next door. At this time our main focus is in helping get restaurants to use the Menu schema so that Google will begin to incorporate it into their own menu displays. If Google begins to make use of the schema, restaurants could be encouraged to create a variety of menus, and have those menus displayed in the most favorable way within the search engine. So when you’re designing, developing, and optimizing your website for restaurant SEO, don’t forget about the unseen aspects, the schema, as they might be the most important parts of your web presence.